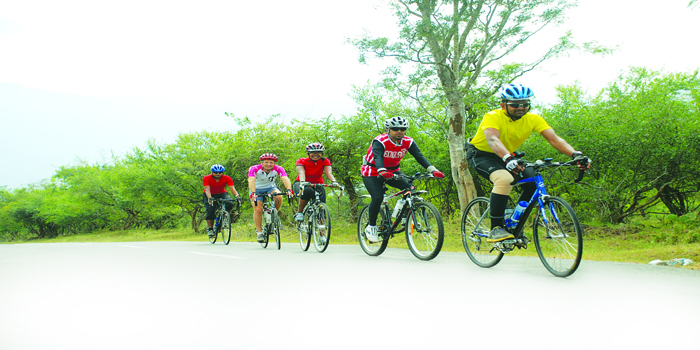 A bicycle race through the hills of Ooty and Nilgiris might not sound like everyonea��s cup of tea. But when it is part of a national-level event as big as the Montra Tour of Nilgiris, the flagship event of city-based NGO, RideACycle Foundation (RAC-F), it sees at least 80 participants every year. Back with its seventh edition, scheduled to take place between December 16 and December 23, it will be conducted on a time-based format. Featuring around 75 riders (including 10 foreigners from UK, Netherlands, Italy, Switzerland and Denmark), the rides will cover a distance of over 900 kms, starting from Bangalore and ending in picturesque Munnar. a�?The race routes will go up to a distance of 40kms each day and riders have the option of either racing individually or as a team,a�? says Sridhar Pabisetty, co-founder of RAC-F. While cycling through places like Mysore, Ooty, Palakkad and Valparai, riders will relish the hairpin bends and flat stretches like the 160km-stretch from Bangalore to Mysore, at the beginning of the ride. However, the highlight of the event will be the climbs, wea��re told. a�?The 12km climb from Masinagudi to Kalhatty in Ooty a�� that has a rapidly gaining elevation of 1,200 metres a�� comes under theA�Hors CategorieA�(the toughest climb in France),a�? Pabisetty reveals, adding that the Valparai-Munnar climb is another tough one. a�?Riders also dona��t need to worry about getting hurt or lost in remote areas, as each of them is tracked via GPS and has the medical support of an ambulance at all times,a�? he assures. What adds to the tour are the scenic visuals and the magnificent locations along the way. Besides the mountains and flora (Gulmohars on Kanakapura Road), the riders can also check out five wildlife sanctuaries (including Mudumalai National Park and Chinnar Wildlife Sanctuary). Not to forget the coffee and tea estates in Coorg and Ooty, respectively, which will give ample excuses to stop for a sip.